If you've been paying attention, you know that I attended the Evernote Conference this year. 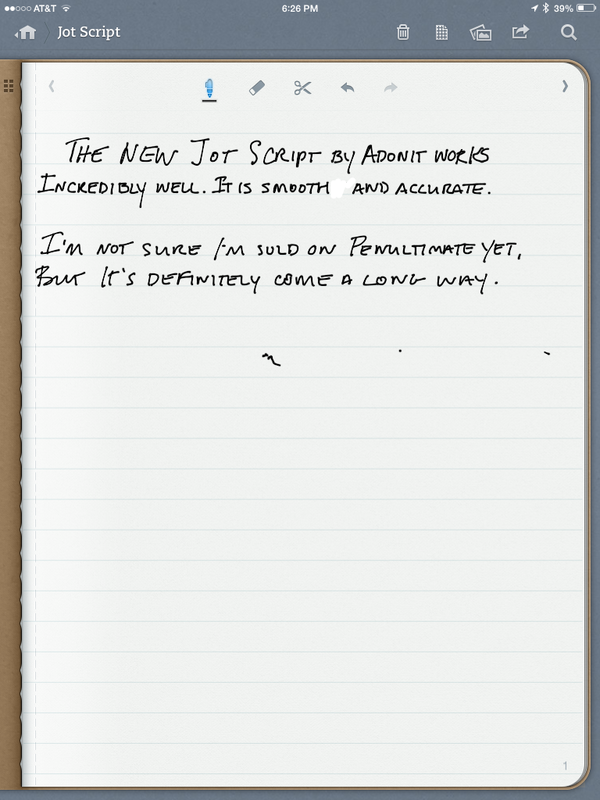 One of the many items unveiled at the conference was the new Jot Script stylus from Adonit. They worked closely with Evernote to come up with the perfect companion stylus for Penultimate. (It works with other apps, as well--more on that later.) The super-cool part about the announcement was that they were giving everyone at the conference a free Jot Script. We just had to wait a bit for them to start shipping. It arrived today. I was already giddy from the arrival of my new 5D mk III, so to get the stylus on the same day was almost too much for my little geek brain to handle. What do I open first?! Okay, so I opened the camera first--can you blame me? As soon as I was finished fondling the new Canon, I tore into the Jot Script box. This thing looks and feels awesome. I mean, we've all had that favorite pen that just sits well in our hands, right? This stylus feels like that. It doesn't even feel like a stylus. Hell, it doesn't look like a stylus. The tip is the size of a ball-point pen. I had a Jot Pro previously, and it just didn't work for me. The Jot Script is everything I found myself wishing the Jot Pro was. Since I've only had it for half-a-day, I'm not going to write a full review yet. But I'll throw in my initial thoughts in case you're on the fence as to whether or not it's worth the price tag. Keep in mind, this stylus was developed primarily for iOS and the iPad/iPhone. It will function as a stylus with other touch screen tablets and phones, but the additional functionality will be missing. Also, Pixelpoint™ and palm rejection require an iPad 3, iPad 4, iPad Air, iPad Mini(both versions), or the iPhone 5. Setting the Jot Script up is pretty straightforward. Unscrew the top, take out the little plastic battery protector, then screw the top back on. On your iPad, make sure Bluetooth is turned on. If you haven't downloaded Penultimate yet, do so now. I'll grab a beer and wait. Got it? Good. Fire it up. Once you login to your Evernote account, you'll see the main notebook screen. Tap the little shield icon in the top left corner, then tap General Settings. From the settings screen, tap Jot Script Evernote Stylus Setup. Press the power button on the barrel of the stylus and wait a few seconds. Penultimate will connect to the stylus, and you'll see the confirmation page. Feel free to test it out. Tap OK to exit the connection screen, then create or open an existing notebook. If you're already familiar with the zoom gesture on the iPad, it's the same in Penultimate. Take two fingers and pinch out to zoom in. You'll be presented with the new zoom screen. Start writing. The new Drift feature in Penultimate will move the screen automatically to keep up with your writing. I have mixed feelings about this feature, but I think it's one of those things that is just going to take some getting used to. I'm still a huge fan of Notability's method of zooming (windowed, at the bottom of the screen,) but I love the simple integration Penultimate has with Evernote, so I'm going to give it a chance. When you're done, pinch in to zoom out. You'll notice a few squiggles in the middle of the page. They were from my wrist. While you're writing, the bluetooth connection kills any input that doesn't come from the pen. But if you pause for more than a second or two, the connection drops so you are able to use your finger to make selections, etc. This is by design, but I wish there was a manual button to connect/disconnect the pen. Every time I stop writing, my palm ends up making marks on the page. I'm sure they'll work out the quirks in the coming months. Overall, I'm extremely impressed with the stylus, and Penultimate has improved enough to get me to give it another shot. I tried the stylus with other apps, and it works just like any other stylus. The selling point here is that instead of a fat, squishy tip, you get that little ball-point-sized tip. If the app you're using is Jot Ready, you'll even get to use some of the advanced features of the stylus. I experimented with Paper by 53, Notability, Procreate, and Photoshop Touch. Some of these have settings for Jot Touch--this seems to help the Jot Script a bit, but not all features are included. Apps that don't have the option to connect to a stylus at all can be interesting to work with--the "ink" doesn't always end up where you expect it to. I also noticed that when using the stylus without a bluetooth connection, it will turn itself off after a period of time. The stylus has to be on in order to function even as a basic stylus. Please don't let my wicked artistic skills humble you in any way. So is it worth the price tag? In my opinion, yes. Even if you're not a Penultimate user, the stylus itself is awesome. If you're not a Penultimate user, give it another shot.